My husband is a big Harry Potter fan, so for his 60th birthday I decided to do a Harry Potter-themed cake. 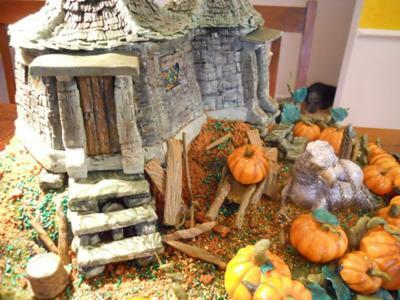 It took about a month to make Hagrid's hut, the superstructure made of pastillage and all the rest from gum paste. The pumpkins are modelling chocolate. The only non-edible element to the cake is Buckbeak, the Hippogryph. He's made from polymer clay. I wanted hubby to have souvenier of the cake. The actual cake is a berry/orange blossom sponge with buttercream and fresh raspberries. The "stones" are made of gum paste. 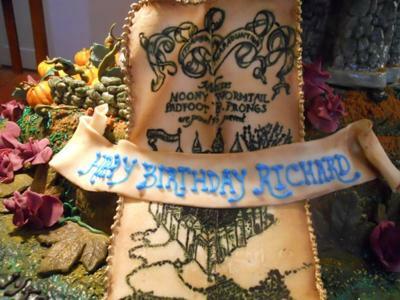 The Marauder's map is made from gum paste and "painted" with food colouring. Absolutely BLOWN AWAY by the amazing detailing here just breathtaking... You have to be a professional! You HAVE to be?!! Surely?! Such a talent as this you'd have to be?! An absolutely beautiful superb job! OMG!!!! This is AMAZING. The detail and work is absolutely beautiful. I'm so glad I found this website and have been able to enjoy your works of art. This cake is absolutely beautiful! So much detail- and it looks amazing, especially with how accurate it is. I hope it tasted as good as it looked. I'm very impressed. 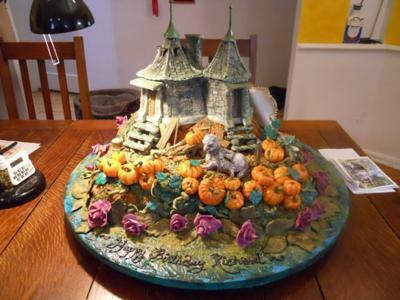 I just saw this cake featured on Cakewrecks.com and it totally blew me away. From reading your description it not only looked amazing, it must have tasted fantastic also. Just adored your cake. I'm a huge Harry Potter fan. Such a great job! Your cake is amazing! and sounds absolutely delicious too.